After playing for a few days and getting a little bored me and Chuck decided to try for a few achievements. 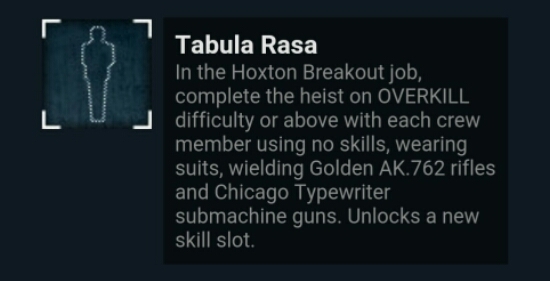 Jokingly Chuck starts a Hoxton Breakout and we brought the required guns for Tabula Rasa. We thought hey let’s see how hard this is, well it was probably the hardest job we have ever done on Payday 2. Numerous tries got us that little bit closer each time, making each try seen that little bit easier. It was just me Chuck and our two bullet sponge AI. Getting up to day 2 seemed to be the hardest part, pushing the car as far forward as possible and as fast as possible was the best way the further forward the car got the less AI spawned behind meaning it was just a hard crawl the the underground car park. We had to take it in turns at collecting ammo so that we both had a chance at fighting. Numerous times we both got downed and either had to try and get the other up or hope the AI did. Once inside the underground car park we had to search for the computer to hack and lower the bollards, simple and straightforward as we both had each others back. Day 2 was still tough but I felt it was less difficult then Day 1, we used the Security Card glitch which meant twice as many cards and opened the armoury and infirmary first. It was only difficult due to the running between objectives but we totally locked down the main room so only had to watch the balconies. Now we did get the achievement but the last 15 minutes was a nail biter. I was down to my last down and Chuck was just put put in jail. We had made it all the way up to the last hack it was looking like another failed attempt. Hoxton had just finished the hack and I jumped into the last room to recover the server. The final assault had started and I was stuck, with nowhere to go I stuck to the back of the room and hoped the assault would end. Unfortunately it was the final and everlasting assault, I waited until there was a small break and made my way to you getaway vehicle. On my way I was tagged and down to 1 hit, I dropped the server and waited for my shield to recover. With two sniper waiting with aim at my exit Hall I had to make a mad dash to the infirmary. Barely making it to the infirmary I recovered my health, popped my head out and took out the snipers. I then had to creep back to the server and try and make my way to the exit door. Rushing down I made it to the final door and setup the drill leaving the AI to take all the damage while I hid in a corner. I had almost no ammo and a 2 minute wait, trying to keep the AI covered and give as much damage as possible once the door was open I finally made it to the escape vehicle and we both got the achievement. So the Battleroyale game mode has had great success with many games. Arma 3 and H1Z1 have official modes with CSGO and Garry’s mod having unofficial versions. The aim is to find loot and kill everyone and you win by being the last survivor. I had played the Arma 3 version during its early days and i was lucky if I could manage to find any loot let alone kill anyone. Last weekend a friend of mine asked if I wanted to play as a coop team on the H1Z1 version. On the H1Z1 version you can play solo or as a team of 2 or 5. We only had 3 so each time we got filled with others who usually did there own thing. My first 3 games started bad I was unable to find any loot and was struggling to escape anyone. I soon found my first weapon 3 games in a recurve bow needless to say I lasted about 4 minutes. I had played so little H1Z1 that I wasn’t expecting much pro gaming from myself. Further into my night and a few games in we started doing average finding each other getting well looted but then we all noticed the same thing. The guns are so inaccurate hit markers are non existent, as an example I shot someone twice and the only part of him I could see was his head I saw blood spatter and I thought to myself how isn’t he dead the guy runs out of cover and kills me and my two buddy’s and was on 86hp (after 2 headshots). We noticed this more and more as the night went on shotgun to the back and they kept running we got breathed on too hard and it was game over. I also noticed the sounds causing confusion most of the night foot steps above shot from below. These are the only two problems I had with the game mode so far but made the night a little less enjoyable. There was a few occasions I shot people with a shotgun from a mile away and got the kill so swings and roundabouts. So I’m not the biggest fan of MMO’s I subscribed to WoW for about 90 days and played about 7. Paid for 120 days on Wild Star and played about 30. And then one game that I thought had put me off for good Archeage, this game fills me with so much hate it makes me sick. I paid for a Founder pack which was very expensive £120+. I love the Alpha and the Beta no connection issues and was fun to play, unfortunately that was short lived. Before release founder pack players received a 7 day grace period before everyone else. I played most nights for the full week, then came the non Founders. I was unable to connect to the server I had played on for a week and the Dev’s answer was start a new character with hours of waiting for little gameplay I gave up. That was week 2 for me, so my patron status was unused for the free days I got with my Founders Pack. That was it until a few weeks ago when I finally started playing again. Much to my disappointment most quests I had started were in completable I found this out after a week of grinding. To make matters worse I hit a wall with Labour points I had non and received so little I was unable to complete quests without standing around. That was the final straw and I uninstalled the game I will never pay a sub for a game and probably never buy a founder pack for any other games due to the disappointment of Archeage. I thought that was it for me and MMO’s until I was asked to jump on TERA. It was labeled free 2 play so I thought a sub would be needed but 3+ weeks on and I’m still loving it. I have probably spent around £30+ on it but that was not needed. This game is totally free to play you can do all quests and the only benefit of having elite (Premium) is a few savings and daily drops. I received 3 days of Elite for free and although it was great and added quickness to the game I feel it took away the grind which makes most MMO’s. I can say if you are looking for an actual free 2 play MMO look no further then TERA. I have a Level 50 and Level 30 character and it has been enjoyable leveling then both. TERA is my flavour of MMO its easy going and fun to play. There is no actual cost although if you are like me and like to reward devs of free 2 play games then little cost. It’s popular and cater for both PVE or PVP, the auction house is fun and you can find some great bargains. Game play is on par with some of the top end MMO’s and playing or guilding with friends is easy.